WINNSBORO, Texas, October 31, 2012 (ENS) – Green Party presidential candidate Jill Stein was arrested this morning after bringing supplies to climate justice activists sitting in trees to stop construction of a pipeline to carry crude oil from the Alberta tar sands to Gulf Coast refineries. The Tar Sands Blockade in east Texas to stop construction of the southern leg of TransCanada’s Keystone XL pipeline is now in its 38th day. Sitters are on platforms nearly 100 feet up in trees at the pipeline route crossing of Texas State Highway 11, about three miles east of downtown Winnsboro. 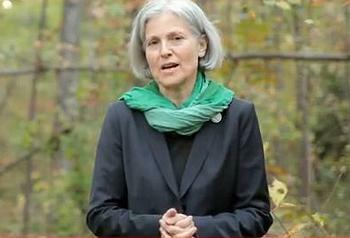 Stein was joined by seven others, including three blockaders and four members of the press. They were delivering fresh fruits and vegetables, canned proteins, trail mix, and Halloween candy. They were not warned of imminent arrests, and the arresting officers did not identify themselves as police. Stein has just been released from Wood County Jail, charged with criminal trespass, a misdemeanor. Before running for office, Stein, a 62-year old Massachusetts physician and mother of two, had never been arrested. She was also arrested earlier this month trying to enter the presidential debate between President Barack Obama and Republican challenger Mitt Romney at Hofstra University in New York. Dr. Stein says she took action today to focus public attention on climate change as Hurricane Sandy wreaks destruction on the U.S. Atlantic coast. “I’m here to connect the dots between superstorm Sandy and the record heat, drought, and fire we’ve seen this year – and this Tar Sands pipeline, which will make all of these problems much worse,” said Stein. The Green New Deal, the centerpiece of Stein’s Green Party campaign, includes investing hundreds of billions of dollars to transition to a carbon-neutral economy, paid for through cuts to the military budget, elimination of subsidies for fossil fuels and nukes, and higher taxes on the wealthy and Wall Street investors. Stein supports reducing the amount of the greenhouse gas carbon dioxide, CO2, in the atmosphere to below 350 parts per million, the level some scientists say is needed to avert the worst consequences of climate change, such as extreme weather. The Tar Sands Blockade action spread today to another Texas location. 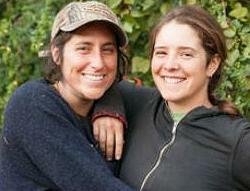 Two women from New England launched a new tree blockade a few hours to the south near Sacul, Texas. TransCanada construction contractors have cleared a path through a pile of felled trees and have moved heavy equipment onto the site. Three machines, an excavator, feller buncher, and a timber forwarder, are immobilized by the tree sitters. This evening officers from the Nacogdoches Sheriff’s Department were on the scene in Sacul with cherry pickers, to physically remove the two sitters from their tree platforms. One of the women, Lauren, was removed from her tree and has been booked for the night in Nacogdoches County Jail. She is charged with felony criminal mischief, resisting arrest, and criminal trespass. Her bail will be set in the morning. The other woman, Pika, a Vermont resident, has climbed up in her tree higher than the cherry picker could reach. Police cut her platform and climb line from her tree and retreated the cherry picker, leaving her in the tree with just the rope she has on her person. Law enforcement is still on the scene with noisy, generator-powered flood lights to induce sleep deprivation. Blockade organizers say this is a dangerous situation but Pika is “an experienced climber” and they expect her to be fine.